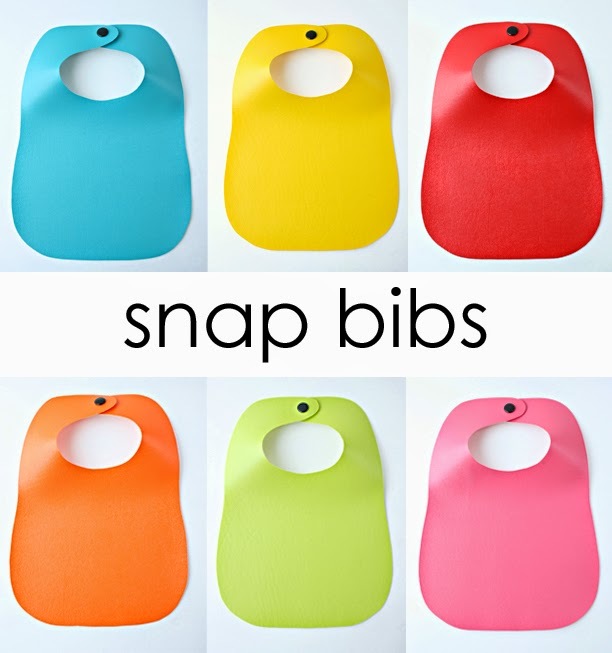 Everyday Art: Snap Bibs Giveaway! I am so excited to share our first give-away for our "Little Ones" series!!! Why? you might ask. Because it's pure and simple genius! Snap bibs are made of thick vinyl and have a heavy duty snap. The vinyl easily rinses off in the sink or with a damp cloth atfer a messy meal. No need to throw in the washing machine! The heavy snap also makes it difficult for kids to take the bib off themselves... poor kids, happy moms. And besides being so practical, they're completely adorable. Just look at all these Yummy Colors! If that's not enough, she even has some with sparkles! You can check out all the fun options HERE! Now, want to win one? I like the solid colored ones! So pretty! The snap is genius. Velcro doesn't always cut it. Love these! I could definitely use one. My daughter can take off ALL the bibs we have.